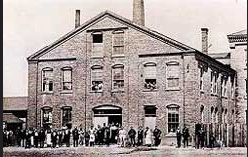 Ben Franklin Goodrich of Akron, Ohio, founded the company of BF Goodrich in 1870. BF Goodrich is one of the largest rubber and tire companies in the world, and it is widely considered one of the best tire companies around. In 1903 the first car to cross the United States used BF Goodrich tires. In 1927, the first plane to cross the Atlantic by Charles Lindberg also used BF Goodrich tires. The company even played a major part in WWI and WWII in producing rubber goods. The BF Goodrich Tire Plant came to Tuscaloosa in 1945, older than its cousin plant in Opelika that came about in the 1960’s. BF Goodrich left the tire business in 1988, but sold its license to Michelin, which explains why some call the plant the Michelin plant or the BF Goodrich plant. Why the business came to Tuscaloosa is still a bit unknown, I assume just like any other business the land was available and the company could find quality workers due to the lack of labor unions in Alabama. At the Tuscaloosa plant, Michelin focuses on making light truck and passenger tires, however every plant specializes in making something different (Alabama’s 13). The tire plant here in Tuscaloosa has a tremendous economic impact in the city. It employs over 1,100 workers, which is one of the largest employers in the City. The Tuscaloosa BF Goodrich plant is what is described as a “Tier 2” plant, meaning it is not a “Tier 1” plant and such as Bridgestone and Goodyear plants. 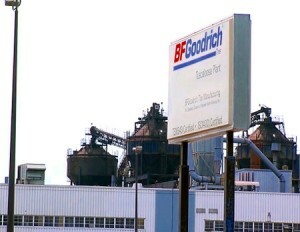 Unfortunately for Tuscaloosa, last year BF Goodrich had to lay off around ten percent of their workers. It was because of the weak economy. This did not do a whole lot to the economy but with Alabama’s unemployment rating at 6.6% according to the Labor Alabama website, it is never a good thing to lay people off. However with over 1000 employees BF Goodrich is one of Tuscaloosa’s largest employers benefiting the city with jobs and providing income for a large part of the city, it could be potentially disastrous to the city if the plant closed down; something that has happened to other tire plants across the country. According to the Labor Alabama website, workers at the Tuscaloosa plant make $24 dollars an hour, which according to the United States Department of Labor is the average hourly wage for all Americans and is classified in the middle class, making the tire plant a stable and safe place to work. According to the Environmental Protection Agency (EPA) the BF Goodrich Plant did not have any violations in 2014, however that does not mean that there is not any environmental impact. In 2012 the plant released 890 air emissions, which can be deemed harmful to the environment according to the EPA. Up until 2009 the plant was releasing lead into the environment. Exposure to lead according to the American Lung Association can have serious affects on the body including death. BF Goodrich released 34,406 pounds of released chemicals into the environment; this is down from a peak in 2009 of 109,277 pounds of chemicals released. Within three miles of the plant there are over 10,000 households. While no direct connection can be seen between the chemicals being released and the health of the people who live around the plant, one has to wonder if ones health is being effected from the chemicals being released. All in all it seems as if the Tire Plant has recognized their environmental impact since 2009 and striven to make a difference because the numbers since then have drastically declined.